ELT A62 Product family shifts the capabilities of training, test and validation to a new level by dealing with multiple sensors of EW equipment suites. 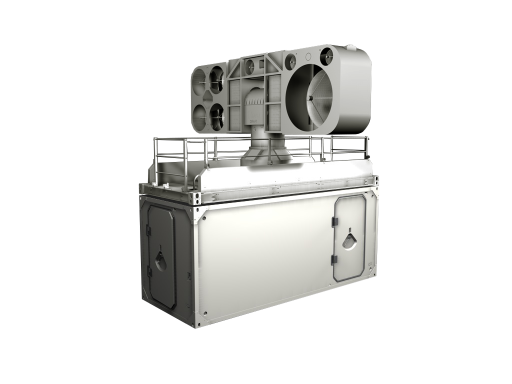 Test and Validation of End user / Customers EW suite’s operational readiness can be perfectly surveyed thanks to generation and transmission of multiple and complex radar and communication scenarios and the capability to record the detected reaction from the system under test. The ELT A62 wide range of operational capabilities is realized through a fully integrated solution. All sensors, signal processing equipment and the two operator posts are integrated in an ultra- light composite- made 20’ ISO container. Along with the antenna system installed on platform the complete system can be operated ashore and has full qualification to be operated on board a ship. A multi-antenna assembly incorporates a wideband and ultra-wideband dual receiver architecture. A digital analyser supported by a powerful software engine allows signal evaluation. Signal generation software allows the definition of complex signals and scenarios that can be send to the atarget system with powerful transmitters. All software is integrated with the user interface thanks to an open and modular architecture, combining overall system information with any other user interfaces. The modular and open system architecture follows the concept of flexible updates and growth potential. Using ELT A62 embedded in an operational scenario, it is a high- level training system for ESm and ECm personnel on board of the unit under training, that can be sea-, land- or airborne. detailed recording of reaction of the system under test.